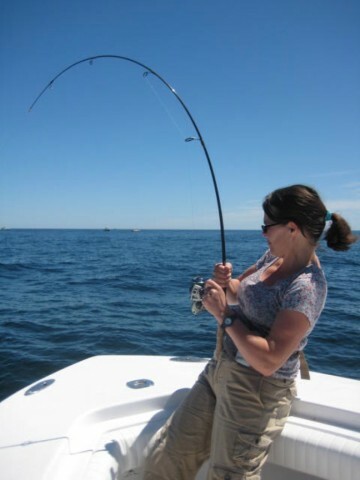 Striped Bass are the quintessential Cape Cod game fish. “Stripers” grow to 50+ inches and can weigh up to 80 pounds. When pursued with the light spinning tackle and fly gear we use on Dragonfly they put up an incredible fight. They are seasonal guests here on Cape Cod, arriving in May from their winter breeding grounds in the Chesapeake and Delaware Bays and the Hudson river. 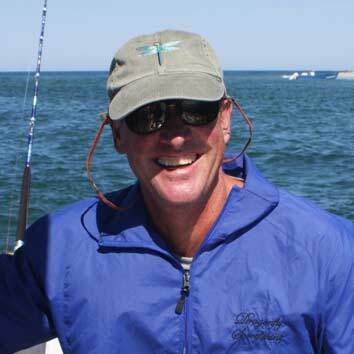 Early season provides fantastic “skinny water” action on the flats of Cape Cod Bay. Large schools of stripers feeding in very shallow water offer exciting sight casting opportunities. Dragonfly’s tower offers a huge advantage in spotting fish on the flats, and I can often see fish from the tower that the angler will not be able to see at water level. Close communication from the tower to the front deck can improve the chances of success dramatically. It is an incredible thrill to see these schools of large stripers swimming slowly into 2-3 feet of crystal clear water and even more of a thrill to see them turn and charge your lure or fly. 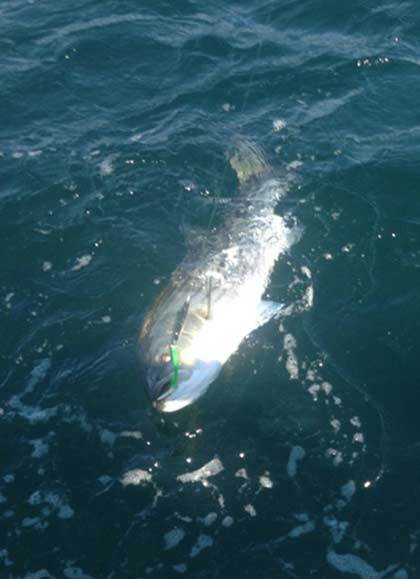 Early season opportunities also abound in the waters of Nantucket sound, where the Stripers will hang around rock piles chasing the herring, menhaden and squid that congregate in the sound each spring to breed. 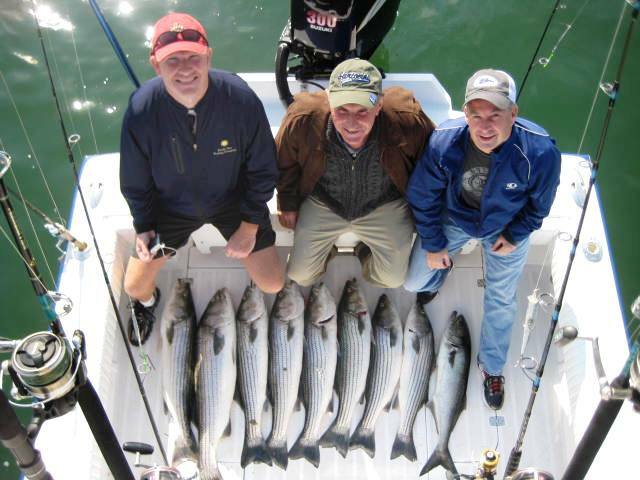 Check out our Striped Bass Trips and Rates. As the season and water temperatures warm, striped bass gravitate towards the cooler waters of the Atlantic Ocean. Fish in Cape Cod Bay will generally move north to Provincetown and then around the ‘backside’ of the Cape to the open Atlantic. Fish in Nantucket sound will move south to the famed rips off Monomoy Island or north through the Cape Cod Canal, eventually winding up in the cooler waters of the Atlantic. Both seasonal “mini-migrations” provide opportunities for incredible fishing. The “rips” off Monomoy Island are a series of shallow sand bars and deeper channels that stretch from the southern tip of Monomoy Island south to Nantucket Island and east for more than 10 miles. Long a hazard to shipping, these dangerous shallow areas have been the site of thousands of shipwrecks over the years. 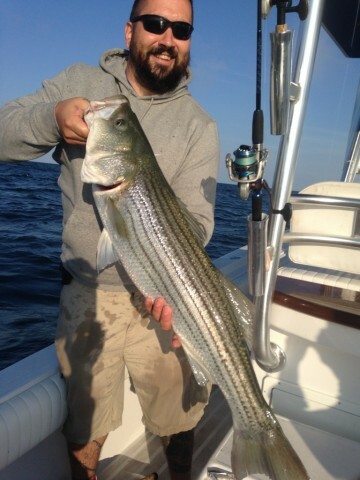 They are also a favorite summer habitat of the striped bass. 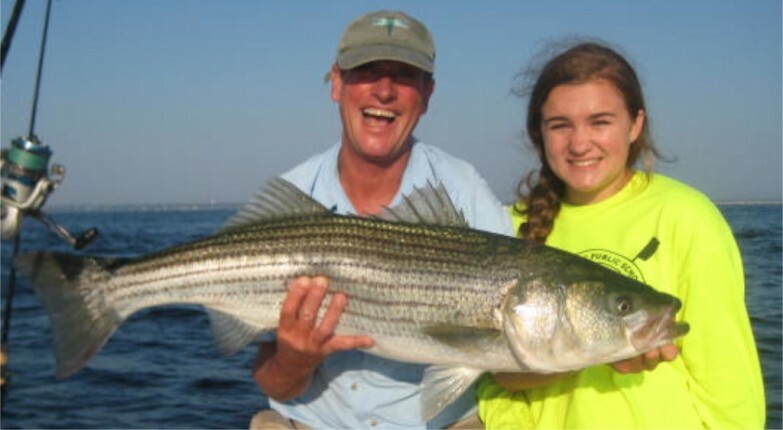 With the aid of an experienced captain who knows the waters, they are a Striped Bass fishing Mecca. Swift currents cross the sandbars constantly as the tide flows in and out of Nantucket sound from the Atlantic Ocean. The striped bass hide from the current behind the sandbars waiting for the rushing tide to bring them food. The tide moving over the sandbars creates standing waves just like those found in swift rivers. Stripers can often be seen crashing on the surface in these waves as they chase baitfish and squid being swept through by the current. These rips can be incredibly rough when it’s windy, but in the more gentle summer months regularly provide for some of the most thrilling striped bass fishing in the world. Stripers in the rips can be tempted by a wide array of terminal tackle, including surface and swimming plugs, live and dead bait and a wide assortment of flies imitating baitfish and squid. A day of fishing the rips when it’s “on” is an unforgettable experience! During mid to late summer, as the water temperatures get to their warmest, large schools of Striped Bass will gravitate to the deeper, cooler waters in the Atlantic Ocean east of Chatham, Orleans and Eastham. Although occasionally found on the surface these fish generally gravitate towards the lower layers of the water column. After locating these large schools with the sonar on the boat we target them by dropping jigs vertically down to them. This vertical jigging technique provides incredible strikes and frequently the action can be nonstop. Having four, five or even six 20-30 pound fish on at once makes for a hectic and joyous occasion! Fish are swimming in all directions with anglers following them, shouting “going under!” and “coming over!” in an all-out effort to keep their lines from crossing in a wonderfully chaotic frenzy we call the “fish dance”! Bluefish are often encountered mixed in with the Bass. These voracious predators are, pound for pound, one of the hardest fighting fish around and provide a great battle on light tackle. 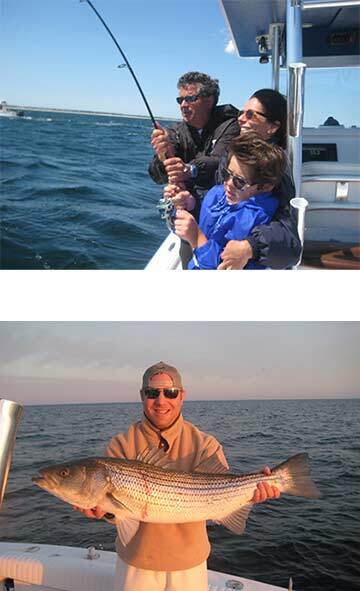 Striped Bass and Bluefish trips provide a fun challenge for everyone, from the novice to the accomplished angler. The custom fishing tackle provided on Dragonfly will maximize your opportunities to catch a trophy fish. 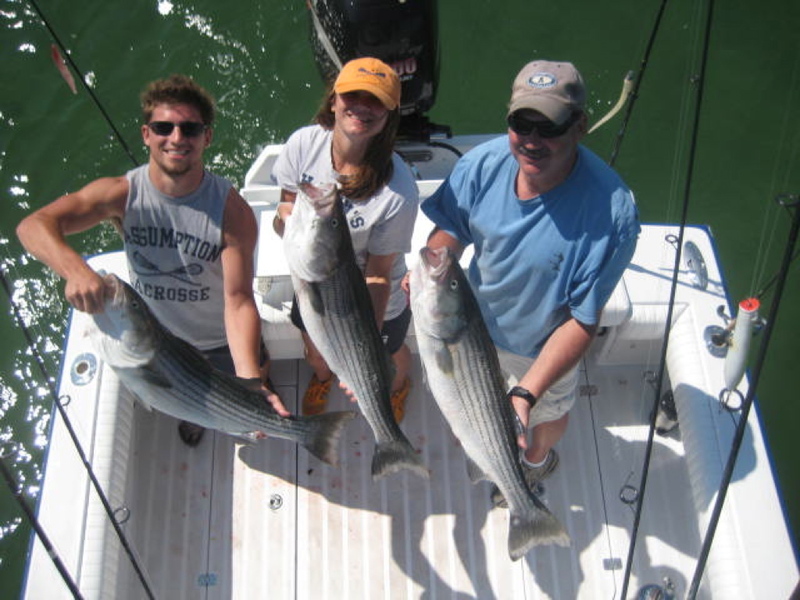 Check out our Striped Bass Trips and Rates. I look forward to having you aboard!